On Saturday, October 9, Team Evotri's Rural Girl, heard those words that every aspiring Ironman triathlete hopes to hear, "You are an Ironman!" 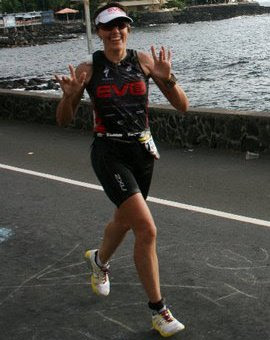 Except that she heard them on Ali'i drive while finishing the 2010 Ford Ironman World Championship! She sported a huge smile flashing shakas with both hands as she crossed the line. Michelle enjoyed the beautiful swim, conquered the challenging winds and heat on the bike course, and cruised through the run in for a 12:06:05 finish. Reflecting on her race she said, "that's the hardest Ironman race ever!" noting that winds were so strong on the bike, that she witnessed athletes falling from being blown off course. And the heat was so strong, she felt that her skin was going to start boiling! She was able to bring herself back together on the run, especially enjoying the crowd support on Ali'i drive, even though she worked it all the way to the line, not allowing another female competitor to beat her; Michelle's way of having fun! After an excellent year finishing two Ironman races, two half-iron distances, several snowshoe races, and all the ups and downs that goes with training, she's welcoming some time off before she readies herself for the 2011 Team Evotri race, the Lifetime Fitness Triathlon in Minneapolis, MN.